Hey you.. yea I'm talking to you.... you still thinking about how you going to get him to notice you? You still trying to look sassy & classy, but not trashy. Well, There are a lot of important factors to looking your best. Being clean, neat, & confident can carry a person a long way; whether it's for a job or for a dinner date with that special someone. There are so many options for hair styles these days. A woman can wear some trendy & conservative hair styles at the same time; meanwhile, saving time & money. Women have many roles to play in society. They have to juggle Jobs, families, & social events while trying to make time for themselves. You know the old saying, "if mama ain't happy, ain't nobody happy." Women love to look glamorous for their significant other; meanwhile, they still want to be noticed in the business world for their expertise, class & style. Whats excepted in the business office, depends on the type of job, you may have. Of course, there are setting wear you would not want to wear bright colored hair; such as, blue, green, & etc. Most people would want their doctor, lawyer, judge, nurse, teacher, or etc. to hold there appearance to a more conservative standard than some other professions. Of course you would look funny if you walked into your doctors office & he wore a MR. T mohawk. Certain things are just more exceptable in certain settings. Now, on the other hand, MR. T Was a trend setter, because now the mohawk is a very popular style for men & women. There are many different styles of mohawk, ranging from an elegant mohawk to a bold & wild mohawk. There will always be someone who will be courageous & daring enough to be a trend setter. For example, Grace Jones was not scared to showcase her uniqueness which reflected her intrinsic beauty. This bold & courageous lady was a model & movie star which also wore a mohawk. We are a diverse group of people. We each have our own desires & goals we seek in life. One thing, I have learned in life is just because you don't like something, doesn't mean another want like it. People come in all shapes, races, & educational levels. People have all types of preferences for there hair styles & fashion. Some may wonder, can you be conservative & trendy; meanwhile, being frugal. The first step is always keep your hair clean & brushed neatly. Appearance goes a long way. Have confidence in yourself because it will show in your attitude & appearance. You may not always have the money to get a beautiful hairstyles every week, but you can make a plan for maintaining your beautiful tresses so you want need reconstructive surgery on your hair later for neglecting it. You know how it is, we try to look like Beyoncé on Florida Evan's budget!! Sometimes you can be frugal by getting a Sew-in or some stuffed twist, when you know you are going to be going through a rough patch. You may pay more for these styles in the beginning, but you can wear them longer. That saves you money, because you don't have to buy weave again in two weeks. Meanwhile, you are still keeping your hair looking pretty while having the extra benefit of protecting it. You also are having the benefit of cutting preparation time down for getting dressed. I wouldn't advise wearing them all the time, but it is a great option. If your trying to get that executive job, look your part. Dress like an executive & get your hair like an executive while you are in school to become that professional person. That relaxing day at the hair salon can help alleviate some of the tension & stress, so you can study better. It will help you in your career by looking like you dressed for success. Move from the basement to the executive office. That's right, You moving on up, like the Jefferson. Steps to transform from looking like aunt Esther to having an executive appearance!! 2-Neatness- clothes neat & hair combed even if it's just a pony tail until you can get to the salon. 3-Relaxation & Beauty- a nice visit to the salon for a relaxing shampoo & elegant style. 4-Confidence- show Happiness & empower yourself to be able to conquer your goals. They want know what hit them !! help make you. You can be conservative & exciting while expressing your intrinsic beauty with a conservative hair styles by Arica Hart; meanwhile, dressing and thinking like a boss. You need your hair style to compliment the the work force; as well as, your personal life. Check out this video of a variety of hair styles. Join the conversation & leave a comment below !! 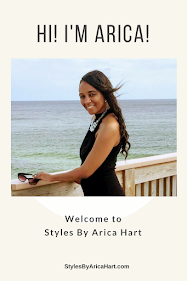 Follow " Styles by Arica Hart" on Facebook, & Pinterest. Be blessed!